It is difficult for humans to imagine that a world of color and sound exists outside of the one that we can perceive, but for some organisms that world is a reality. Usually these animals aren’t ones that we can readily relate to; bats and dolphins are two examples that both possess the ability to hear and emit high-frequency sounds. And so the discovery that a fellow primate, the Philippine tarsier (Tarsius syrichta), may have the ability to emit sounds up to 91 kHz comes as a surprise to their human relatives who can hear sounds up to 20 kHz. The possibility that tarsiers may be able to communicate in the pure ultrasound, is exciting–species that do this are rare, and the ability to communicate in such high frequencies could have a number of advantages. Gathering scientific proof of these abilities was difficult; tarsiers are a threatened species and difficult to maintain in captivity. In order to have the least amount of impact, researchers captured the tarsiers in mist nets and brought them to a sound-attenuating chamber. They then used the auditory brainstem response method along with various software programs in order to test whether tarsiers could hear ultrasonic sounds. When analyzing the sounds that tarsiers make to see if they occurred in the pure ultrasound, researchers recorded wild tarsiers on the islands of Bohol and Leyte with a special recording unit. Even while recording, it was clear that the tarsiers were utilizing pure ultrasound for communication (Figure 2); they frequently made sounds that the researchers could not hear, and were also recorded making calls in the pure ultrasound during human handling and in enclosures. Sensitivity tests showed that Tarsius syrichta‘s high-frequency limit was approximately 91 kHz. Researchers were also successful in recording calls in the pure ultrasound (at around 70kHz) from eight different individuals. 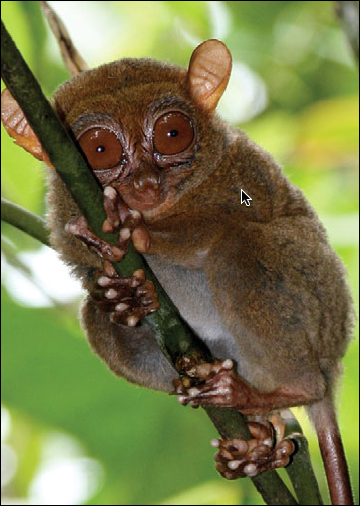 These calls are similar to other tarsier species, but those were all found to be below 34 kHz, and also included tones in less than 20 kHz. It is thought that the ability to perceive and make ultrasonic sounds is beneficial to the tarsiers. They serve as sort of private channels on which individuals can communicate without attracting the attention of predators or giving away their location to prey. It is also thought that they make it easier for tarsiers to pick signals out of background noise, and that such sounds are energetically more efficient. Improved hearing may also be used to help tarsiers hunt at night; their eyes lack the tapetum lucidum (found in the retina) that allows most nocturnal predators to see effectively. Through additional research, the researchers hope to more fully flesh out the advantage that ultrasonic communication provides for tarsiers.